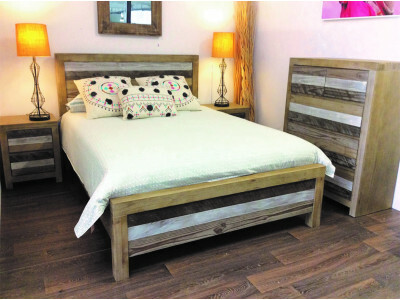 The gorgeous Archie range is made from reclaimed pine timber with a white wash finish. Full metal ex.. The Burton 4 piece Double suite with tallboy, and side tables is crafted from quality acacia timber .. The Burton 4 piece King suite with tallboy and side tables is crafted from quality acacia timber wit.. 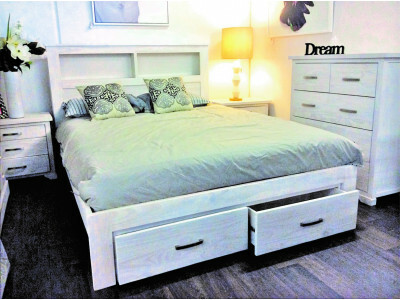 The Burton 4 piece bedroom suite with tallboy and side tables is crafted from quality acacia timber .. The elegant design and high quality construction of the Courtney Bedroom Suite gives your bedroom ti.. 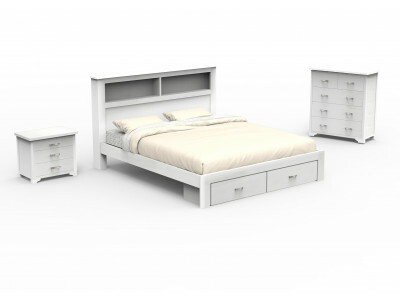 The stylish Franklin furniture range is crafted with quality New Zealand Pine with a winter garden f..
Lovely 4 piece bedroom suite made from acacia wood in a smoke white and ash grey finish. Drawer box .. The stunning Oslo furniture range is crafted with quality New Zealand Pine. 4 piece bedroom suite in..
Gorgeous silver grey bedroom suite which includes either a double or queen bed, 2 bedsides and a 4 d..
Gorgeous queen bedroom suite covered in a beautiful fabric, available in either blue or beige. Inclu..